Whew...the holidays are officially here! We blink and the week is already gone, and we feel like we are on warp speed with all the fun happenings. We are sooooo excited, and have a few fun things to share coming up in the next week or so. We might have a fun goodie or two for you so stay tuned. Okay today we are going to link up with some of our favorite bloggers for Friday Favorites, but we are going to switch things up a bit. Normally we share a random assortment of our favorite weekly moments or finds. This week though we are going to concentrate on one topic - holiday style! There is something about the holiday season that just makes us want to put sequins on ourselves from head to toe! We had to do a holiday photoshoot early last month, and it was so much fun getting all glammed up. We had so much fun shopping for holiday attire together, and snagged this gorgeous gold dress and this fun red jumpsuit for less than $100! All we have to do is add our favorite red lip stick, a few fun accessories and we are super glam for any holiday event. We have been itching to wear them again, and can't wait to break them out at holiday parties coming up because in these looks we are soooo ready! The exact red jumpsuit is currently sold out, but this one and this one are super similar! Plaid is one of our favorite patterns to incorporate into our holiday style. From traditional tartan to ginghams - we love it all! We try to look for pieces that are versatile. And that's key when you need to be at the Preschool holiday program one minute and a evening holiday dinner the next. We want items that are festive for any holiday event, but that work for our lifestyle. Plaid is one of the easiest ways to look holiday ready. 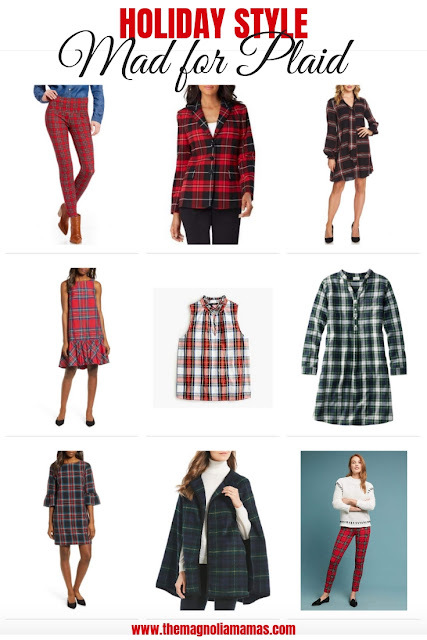 This next plaid has been so easy to take from day to night. Just a flip of a shoe from a boot to a heel and you are ready for any style of holiday celebration. Also, if you are a fan of this Hooded Faux Fur Vest let us know. We have some discount codes that we received from the retailer. It's already pretty inexpensive and this would make it super cheap! Just leave us a comment or send us an email and we will send you a special code. This tartan plaid hooded vest has been one of our favorite fall finds, and is perfectly weighted for winter too! 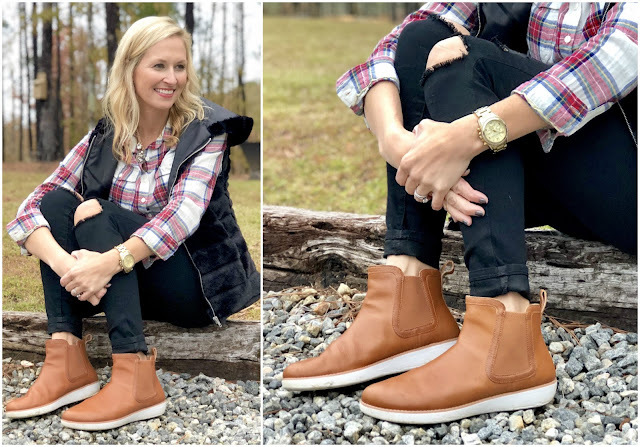 It adds just a little pop of fun to a casual holiday outfit. 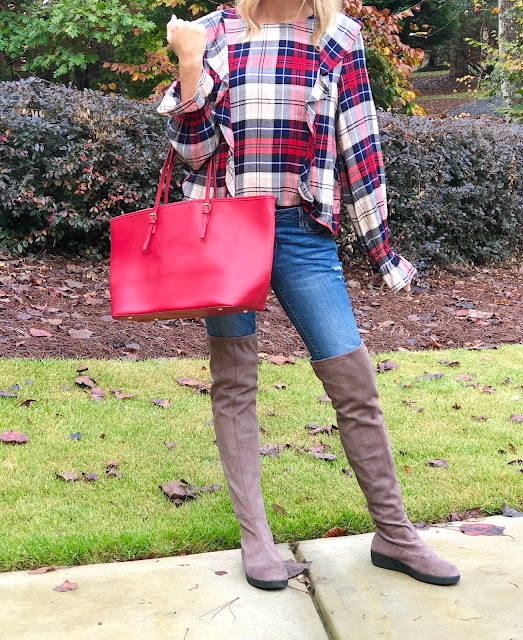 And this fun plaid top was a find from last year, but we've spotted so many plaid tops in similar styles you will easily be able to recreate the same holiday look. The over-the-knee boots and the pop of red tote complete this holiday ready look. A classic go-to will always be a little black dress. But dress or pants - head to toe black will always be chic. We love this look for any event, but for the holiday season it makes getting dressed oh so easy. All you have to do is add a fun accessory or a little pop of color and you are all set to go. Such an effortless way to holiday. We have hopped on board the faux fur vest trend in a major way, and love love love this fun blush colored vest! 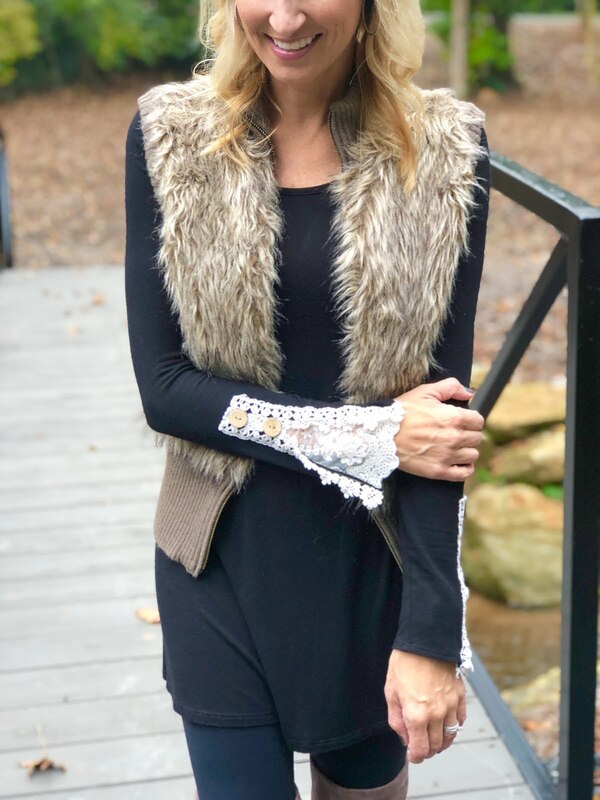 It's so cozy and is such a fun piece to add a little something extra to any outfit, and we love it partnered with all black and metallic accessories to make it a little more holiday ready. Not to mention the comfortable factor of this outfit is on another level. From the softest tunic shirt ever made to the comfiest of ballet flats to the stretchy jeans - we could live in this outfit forever and not complain once! Sorry, not sorry about another faux fur vest. We warned you we were on the faux fur train, and we don't see us getting off anytime soon. 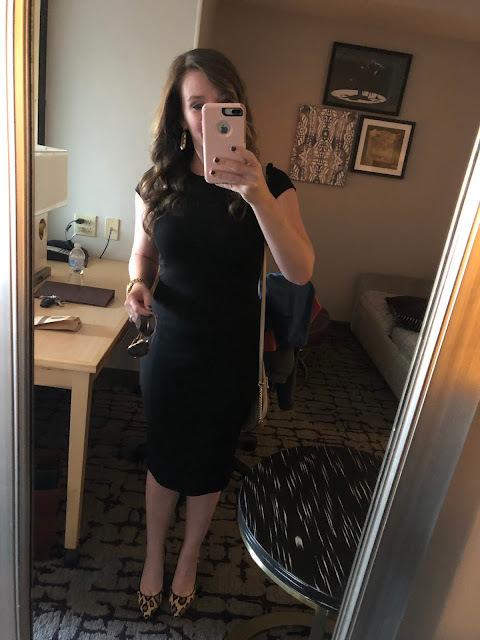 Sorry for the mirror selfie on this one, but this little black dress has been worn many a time. 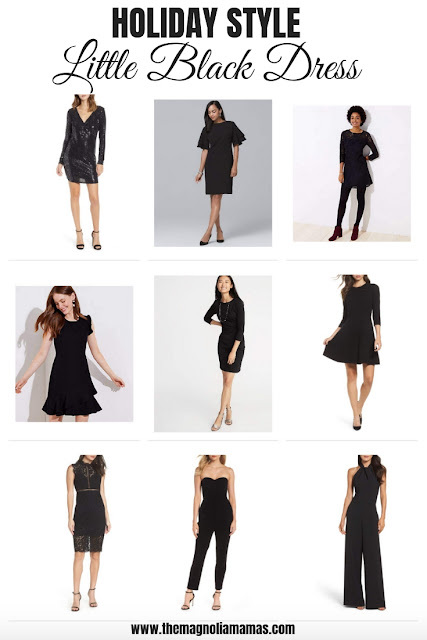 It is our go-to LBD for any event we have. It is super flattering and has the best back zipper detail. It's currently on sale and definitely is worth an "add to cart". That wraps up our holiday style guide! Do you have a favorite look? Now off to grab some champagne and make the holiday rounds.